I’ve made this recipe 2 times in the last 3 days and find myself licking my fingers clean it is so good. This is definitely more for the older child/adult. My 10 year old niece loved it but my little guys not so much. I’m still working on them, I don’t think they can appreciate goat cheese just yet!. The crisped pancetta and goat cheese are the perfect pair here. I highly recommend this one, I’m sure I’ll be making it tomorrow too! I’ve also been fiddling around with fresh haricot vert (fancy for green beans) and I am in love with those too, the recipe and pics will be coming soon. 1. Heat oil into a large skillet over medium heat. When hot, cook pancetta until starts to brown, reduce to medium low. 2. Drop asparagus into boiling water for 60 seconds. With a large slotted spoon, transfer asparagus to skillet. Season with a pinch of salt. Cook and stir for 2-3 minutes or until heated through. 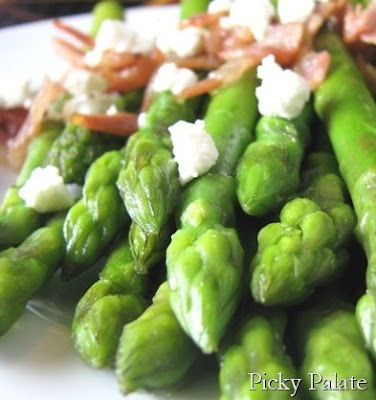 Transfer asparagus and pancetta to a serving plate and top with crumbled goat cheese. Ok, so now for the Oh so bad. Yes, these Chocolate Stuffed Butterfinger Brownies are certainly not in the healthy food group but let me tell you, this simple little brownie recipe I put together last week had everyone at our last birthday party raving. No one could believe they were from a mix, shhhhh don’t tell anyone. They really take just minutes to prepare and you’ll be on your way to impressing all your family and friends. Just don’t do like I did and give most of them away before everyone had one. It didn’t go over well at all! Go and round up those Giant Hersey’s Bars when they are on sale, you’ll break it into squares and hide them inside the brownies. You’ll find a fun chocolaty surprise! The Butterfinger top gets slightly crisp and wonderful. Love these. 1. Prepare brownie batter according to package directions. 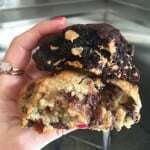 Use a cookie scoop and fill paper lined muffin tins ½ full of brownie batter. Place 1 chocolate bar square into each cup and top with remaining brownie mix. 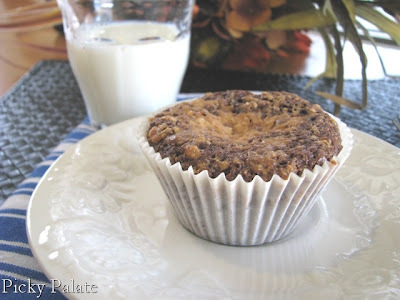 Top with crushed Butterfinger. 2. Bake at 350 degrees F. for 29-32 minutes or until brownies are cooked through. Make sure they are cooked through completely or the centers will cave in the middle. I took mine out at about 29 minutes and they were great. Let cool for 10 minutes, then dig in! Here’s me and my cutie pie “Bunka” on his 78th birthday last week. When I was a little tyke I called him Bunka instead of grandpa, now he is known as Bunka by just about everyone. Isn’t he the cutest thing!? Love you cutie! 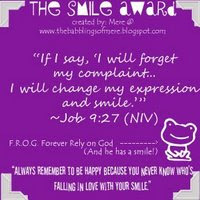 Thank you so much to Kimberly from Take a nothing day, make it all worthwhile, for thinking of me for this Smile Award! She has a fantastic uplifting blog. If it wasn’t so darn late, I’d pass it on to some fellow bloggers right now, but I’ll put that on my list for next week. Thanks again!! Coming up soon are 2 breakfast/brunch recipes that’ll send your tastebuds through the roof and of course some more fun farmer’s market cooking. Have a great weekend! Your asparagus looks so good I want to run over to a farmers market right now! Your brownie creations never end! I ♥ it~! And have so many to try and the asparagus looks divine. Well done! Wow! Both of those recipes have my mouth watering at breakfast time! LOL! Fantastic photos by the way! 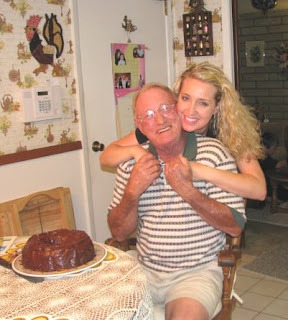 Cute pic of you & your grandpa – he looks like a sweetie! that asparagus looks delicious, especially with the cheese and bacon. i first thought that was feta cheese but once you said goat cheese, i realized it wasn’t! wow, those brownies look delicious. i *know* everyone here would love them, so fo course i will be making them. what a cute picture of you jenny! That asparagus looks SO good! My husband really likes it so I’ll have to keep that recipe on hand. Goodness…those brownies are making my mouth water just looking at them. You have got the best brownie ideas. We will just have to try them out. As always…these look amazing! I am pretty seriously thinking about those stuffed brownies…I might not be able to hold back. This might be love! I know, I need to go back and get more. Yes, pour lots of milk! I don’t know why I am so addicted to new brownies! I knew the poor asparagus probably wouldn’t be the favorite here! Yah, it is a great way to enjoy asparagus. Treat yourself to some brownies this weekend!! As good as those brownies sound, I’m really wanting some of that asparagus! I can see why you’ve made it so many times already! 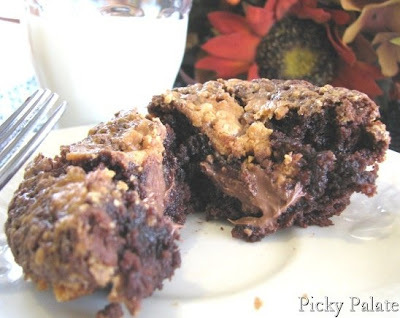 Your brownie-butterfinger concoction looks so delicious! 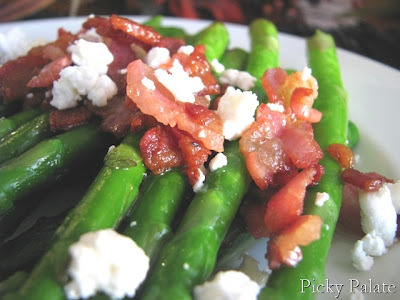 I really love the asparagus with pancetta and goat cheese though. The pictures are great. The asparagus is so vibrant. Goat cheese and pancetta and you have me happy! I’m not the asparagus kind but I have to tell you your look perfectly cooked, their “greeniness” is beautiful. About the brownies I can only say one thing: I want one now!!!!!!!!! Grandpa is a cutie thing and so are you! I’m with you Deborah, I’m all over the asparagus, although I guess I’d have a brownie too! The asparagus was ultra vibrant, love it! Hard to go wrong with goat cheese and pancetta huh! Mmmmmn! I could eat the asparagus as my dinner and the brownies as dessert! the asparagus looks good….but i wanna be bad !! those brownies look great!! that’s my terrible sweet tooth talking!! Hi Jenny! I am one of those “silent readers” that never comment, but ALWAYS check your blog for the latest recipe. 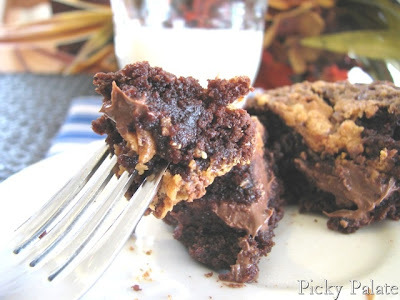 This oh-so-bad brownie recipe is JUST what I needed! We have to bring a dessert to my niece’s baby blessing on Sunday, and I have no time to bake anything! This will be the most perfect, easy, feed-a-lot-of-people dessert ever! Thank you :-). 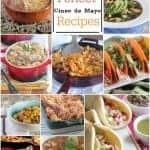 Keep the recipes coming! Also, do you mind if I put your blog on my links? you are by far my favortie blog site to go to! we had the tuscan house chicken with the carrots and green beans!! OHMYGOODNESS!!! I want to make the brownies…just trying to think of a time to make them, so that my family won’t be the only ones to gain weight from them! 😉 thanks for sharing all of the wonderful recipes!! you rock! I’m all over those veggies. Aren’t I strange-I would choose the asparagus over the brownies. Although, I’d really want both-but if I had to choose. Cute pic with Bunka and congrats on another award. That asparagus recipe looks amazing! I love just about anything with goat cheese. Great photo with you and your Bunka! Hi Bunny, go enjoy some Butterfinger Brownies!! Please do add me to your blog list, that’s great! Thanks for taking the time to comment. I really enjoy reading them!! Come back soon! Thanks so much for your kind comment! Glad to hear your family enjoyed the Tuscan Chicken Dinner, I really love that one. I’m the same way when I bake, it’s got to be a time when I can take a big plate to share! Thanks Jeena, I still get a kick everytime my boys say Bunka knowing that’s what I started! I’ve been the same way lately. Just love those veggis! I just found your blog & am amazed at the wonderful recipies…I have emailed your blog address to my family & friends who love to cook too. I love the pictures along with the recipies…you do a great job. Thank you so much for your comment and for passing me on to family and friends. Glad you found my blog! You’ll have to keep me posted on the recipes you try out!! Please feel free to email with any questions. Come back soon! The brownies look great – I’m known hereabouts as the queen of brownies for all my creations too -it is amazing what you can do to a brownie mix that gets everyone talking! Thanks for the great recipe. Those both look and sound fantastic! How many brownies does this make? I noticed you said to cut the chocolate bar into 12 pieces, but you put two in each cupcade. So, does it only make six cupcakes? Hi, the brownies look and sound delicious… What temperature do you cook them at? Thanks for catching my typos, I just edited the recipe. 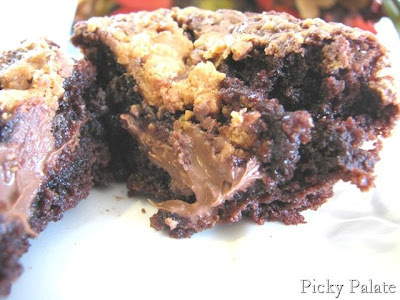 It makes 12 cupcakes and you put 1 piece of chocolate in the center of each brownie. I just edited the recipe, it should be baked at 350 F.
Oh, the butterfinger top looks delicious. Oh and…for my video posts..my computer has a built in web cam..so there really isnt anything special I have to do. It seems eaiser than typong a post! No spell check required! Those brownies look too stinkin delicious! why, oh why do i read this blog? you have no idea how tempted i am to make every single dessert on here! And the bad is oh so good! Gosh, you made my day! hey jenny! if you take a look at my blog, you’ll find something on there! oh btw, do you mind if i add you to my blogroll? thanks so much for your comment! okay, you were probably wondering who that was commenting (hyeknitter) – sorry that was me logged in my sister’s account! You are funny, I’ve done that before with my sister’s account. Please do add me to your blogroll!! Thanks! I made this Saturday night – we had some friends over – I made them in a 9 x 13 pan – and everyone loved them – the whole pan disappeared! 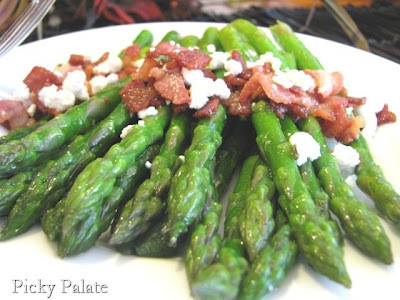 What a great twist on asparagus – I love goat cheese on anything and well Bacon that is in a category all by itself!! The brownies look off the charts!! I made the brownies last night and they were to die for!!! I loved the chocolate center! Unfortunately, I only let myself have one and am giving the rest away! Thanks for the recipe. Next time you make the asparagus get some good Balsamic vinegar reduce it and drizzle over the dish! We kind of do the same dish but wrap the asparagus in thin slices of pancetta or procsiutto. Jenny, I made these brownies last night and they were a hit!!! I love a good brownie, always. My husband isn’t a brownie eater, but I scored with this one! He said it is the best brownie he has ever had! Thanks! I can never go wrong with your recipes. I just bought the butterfingers and hersheys bars. I’m making this tonight! Thanks for a great recipe. I was wondering if you would share what kind of brownie mix you prefer to use in your recipes? I always get turned off by the taste of the oil in them when I make them – I wonder what kind of oil you use too?